After American entry into World War I in 1917, President Woodrow Wilson ordered all of Michigan's National Guard to Camp Grayling. Eight thousand of these troops then went to Texas where they joined Wisconsin soldiers to form the 32nd Division. Arriving in France in 1918 the division earned the name "Red Arrow" for its swift assaults through German lines. During World War II the 32nd Red Arrow Division fought courageously in the Pacific Theatre and received a commendation from General Douglas MacArthur. Description : A monument dedicated to A Bartlett King 107th Engineers 32nd Division who died in France October 7th 1918. He was the former leader of Boy Scout Troop No.1 in Marquette MI. 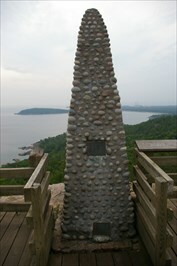 This monument was built by the Boy Scout Troop on Sugarloaf Mountain near Marquette MI. A short .5 mile hike up to the Sugarloaf Mountain look out also yields great views of the Lake Superior shore line and Marquette MO. There are 2 trails one easier with steps and one more difficult. The trail head is located off County Road 550. About 3 miles north of Marquette. The Doughboy Statue was erected in 1924 after the Bay City Women's Improvement Committee approached the Bay City Commission about erecting a statue in 1923, Brady said. It cost $2,100. 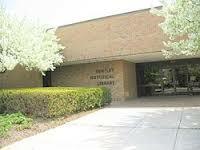 The bronze statue has been under the care and auspices of the Bay County Library System. While there doesn't appear to be any documentation of maintenance of the statue, it's in remarkably good shape. Address : 3220 W. Lang Rd. 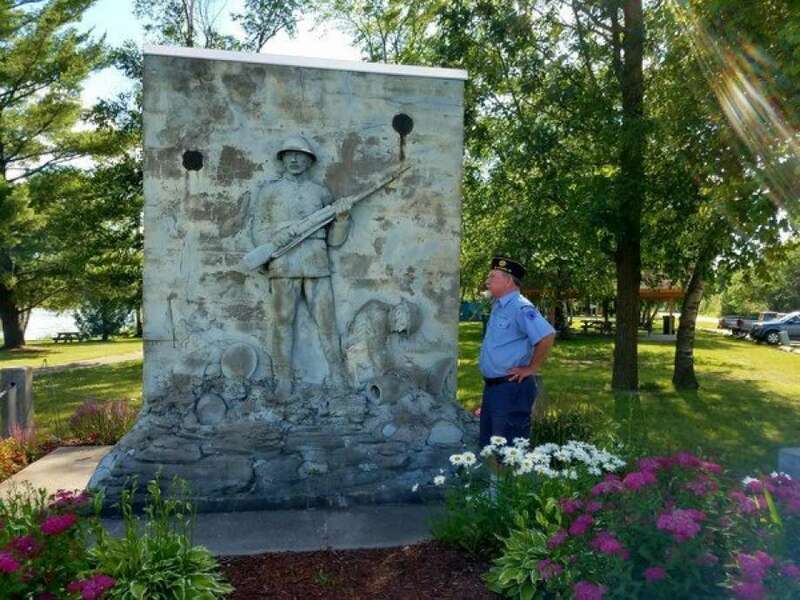 Beaverton officials seek funding to conserve the city's unusual WWI memorial -- a relief in concrete (dedicated 1925) by German-born sculptor Helmuth Von Zengen that includes both a dead and a wounded doughboy. Erected in 1925, the World War I monument "The Survivor" in Beaverton, showing a dead soldier, an injured soldier and a surviving soldier standing with a rifle in hand, needs some extra care after years of deterioration. "It's a unique statue," Beaverton City Council member Ed Rachwitz said. "It's a special design." The cement statue was designed and hand carved by a German sculptor and artist, Helmuth Von Zengen. Von Zengen reportedly dated Alva McKimmy and the monument was a tribute to her family members. Jasper and Caroline McKimmy, of Beaverton, had three sons -- Walter, Raymond and Earl -- fight in World War I. Earl died of diphtheria in 1918 while serving, Walter was injured in a 1922 accident and died in 1924, and Raymond died in 1967. 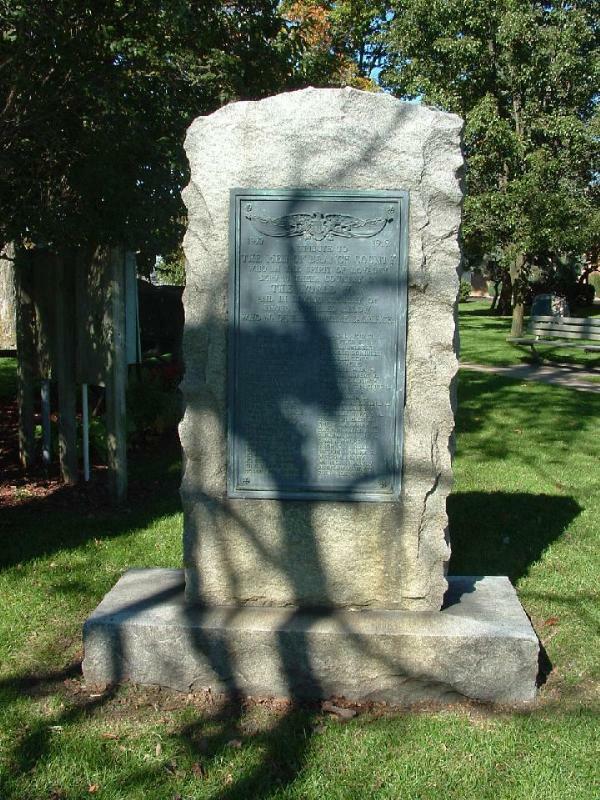 To help preserve the memorial, city officials recently applied for a $2,000 matching grant through the World War I Centennial Commssion, Ed Rachwitz, who is spearheading the endeavor, enlisted the help of Gladwin County residents Scott Govitz, Bruce Guy and Bob Frei to help draft the application. Govitz helped with the drafting while history buffs Guy and Frei provided the background. Rachwitz said the submission included a wealth of history about the statue. 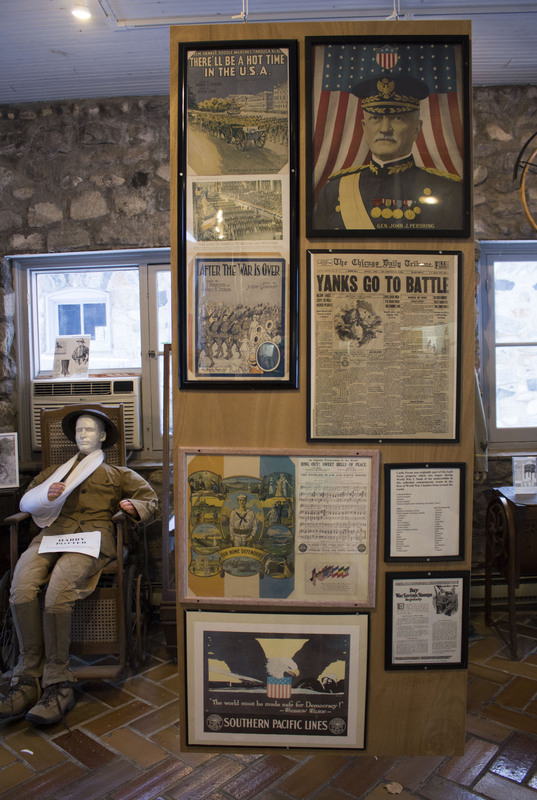 According to Susan Mennenga, World War I Centennial project manager, the commission is giving out 100 $2,000 matching grants in observance of the upcoming centennial on Nov. 11, 2018. If approved, the grant would help toward the estimated $5,850 total needed to preserve the statue, Rachwitz said. The city won't hear back about the grant until November. Rachwitz, who served in the Navy during the Vietnam War, said the $5,850 is just the cost to sustain the monument and prevent further deterioration. He said the hope is to stop the deterioration and then consider having the statue restored. The city doesn't have an estimated cost on restoration. The statue was the first of its kind in Michigan and was presented on June 14, 1925. It was reported that an estimated 3,000 people attended its unveiling. 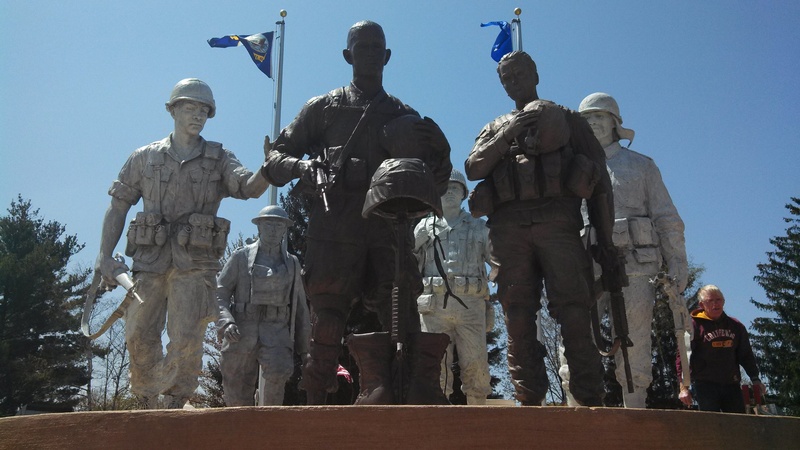 The Amerivan Legion Post 171 and residents' generosity made the statue possible. 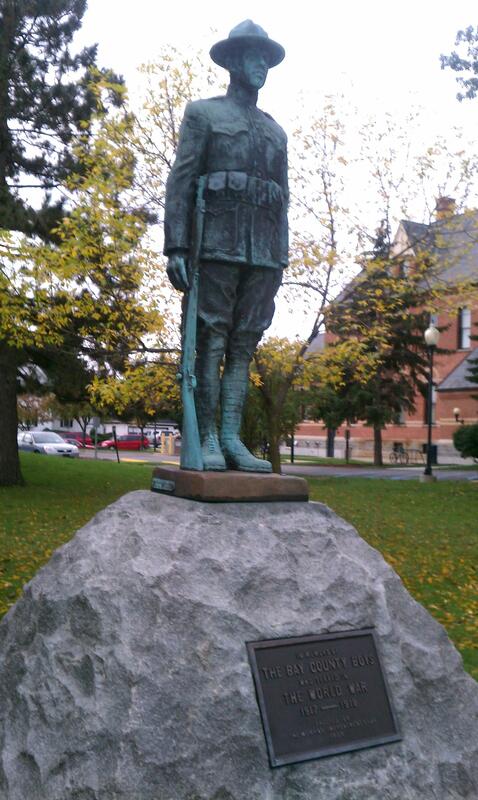 According to the World War I Commission, it's unknown if there are other statues like it in the state. The statue originally stood in front of Brown Machine and was later moved to Ross Lake Park in 1986. "World War I was supposed to be the war to end all wars," Rachwitz said of the global war that began in Europe on July 28, 1914 and ended Nov. 11, 1918. 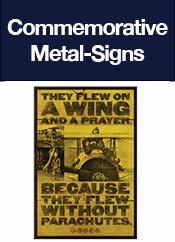 An estimated 135,000 Michiganders served in World War I and about 5,000 were killed. Gladwin County residents, such as Edna Breault, said they are honored to have such a statue in their community. Breault said she has family members who have served in the military, including World War I. "It is wonderful that we have this statue to honor those who served this country," Breault said. "It is also important that we remember them and their sacrifices, especially when we celebrate our Independence." 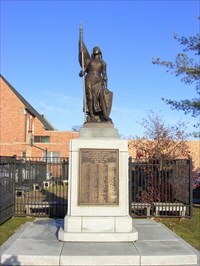 To make donations to preserve the World War I stature or learn more about it, contact Ed Rachwitz at appleed@hotmail.com and put "WWI memorial" in the subject line. Theodore Koch work for the Bentley Historical Library before WW1. This monument lists the names of the boys of St. Peters parish in Mt. Clemens, MI. that served their country in The Great War from 1917-1918. 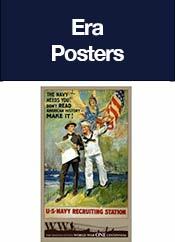 World War I was a global war which took place primarily in Europe from 1914 to 1918. Over 40 million casualties resulted, including approximately 20 million military and civilian deaths. Over 60 million European soldiers were mobilized from 1914 to 1918. Is described as Full-length figure of Joan of Arc dressed in armor and standing in contrapposto (weight-bearing leg, proper right). She gazes towards sky. Proper right hand grips the pole of a flag or banner; proper left rests on the upper edge of a shield which is balanced upright, tip resting on the ground, behind bent proper left leg. Shield emblazoned with upright sword, pommel down, and crown, flanked by fleurs-de-lis. Figure wears a sword, belted to hips and slung behind legs. Between the feet, a spiked war club lies on the ground. The statue is made from zinc or lead with a granite base. Statue: approx. 8 x 2 x 2 ft. Base: approx. 8 1/2 x 11 3/4 x 11 3/4 ft. This is a plaque in a park dedicated to several war memorials. It honors those from Branch County, Michigan, who gave their lives in The World War for their country.There are several guns on display as well, demonstrating the various types of weaponry used throughout the years. One pair was dedicated in 1988, honoring those who served. The 1918 Museum at Castle Farms was originally the Blacksmith Shop for Loeb Farms. It was built during WW1 with Albert Loeb’s income from Sears and Roebuck. The museum contains two separate collections. 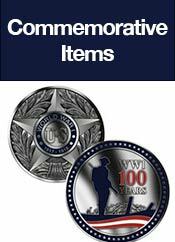 The first being the WW1 collection, which includes vintage uniforms, army equipment, posters, miniature soldiers, historic newspaper clippings and sheet music from World War I. The second collection includes items which were sold from 1918 Sears catalogs, including many toys, clothing, sports equipment, tools, toiletries and mail order food packages. 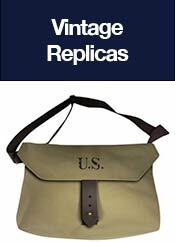 Original prices and descriptions from the catalogs are featured beside many of the items. In May of 2007 the Zylman Family lost their son Casey in Iraq. They wanted to do something to honor Casey’s memory. Randy Zylman served with the 25th Infantry Division in Vietnam, and Casey also served with the 25th Infantry as a Calvary Scout during Operation Iraqi Freedom. After much thought it was decided that they wanted to honor the Coleman Community and all Area Veterans with something bigger. 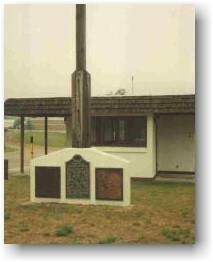 The Coleman Veterans Memorial Committee was founded. There are 3 walkways leading into the center of the court yard. It represents the service men and women who answered the call to duty, coming together from all directions, walks of life, and their own personal reasons to serve our nation and become America's defenders. The outer circle represents how the individual services circle together to protect our country and how we are unified as one nation and as brothers and sisters. All 5 service flags representing the Army, Navy, Air Force, Marines and Coast Guard are on the perimeter of the circle. "Bricks of Honor" are within the inner walkway. The personalized bricks of those who served our nation, it consists of Coleman community members, Midland County, Isabella County and people all over our country who purchased a brick to honor their loved one or friends who served. The remaining statues will be a shade of white. This represents the spirits of those who gave their lives in those wars. It also represents their motives were pure when they served. The 3rd Soldiers Statue is from Vietnam Era. His hand is reaching out the shoulder to offer strength. The 4th is from Korea and the 5th is from WWII and our last statue is from WWI to complete our memorial. They are all filing into the court yard to honor and console a brother. As family, who fought and died for each other. So come and visit our memorial! Join us and be a part of something special in our community, help us educate the young members of our community. There are 2 other war memorials in the front of the court yard placed on either side of the American Flag. 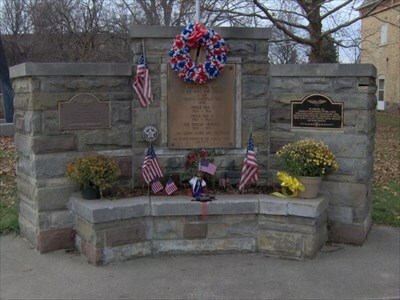 These are the 2 original Veterans Memorials from the VFW memorial. They were moved here from their original resting place to be a part of this special Memorial. Our Nations Flag is centered on the memorials. The POW/MIA Flag is seated to its left and the State of Michigan flag is on the right. The Statues are facing away from you as you walk into this memorial so that when you visit our beautiful memorial, you will be walking into the court yard along with the soldiers, taking in all the names of those who served, to those who paid the Ultimate Sacrifice, to pay tribute, honor and reflect with them. This memorial is an educational tool to show what the cost we have paid to be a free nation. 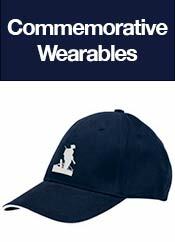 That is the meaning of our memorial. The original stands at the legendary Schofield Barracks, Hawaii, home of the 25th Infantry Division. They have allowed us to share their memorial from across the Pacific! Honoring those who served, Dedicated to those who sacrificed! "To the ones who served"
This plaque donated by the American Legion and V.F.W.